If you’re a timeshare owner, you’ve undoubtedly seen the option on these sites to purchase an “extra vacation” for cash. These companies handle exchanging your timeshare to stay at a different resort, but they also offer these opportunities to buy a vacation and just put it on your credit card (not exchanging your unit at all). First I looked at Interval International, and searched for Getaways (the name on II for these “cash” vacations). 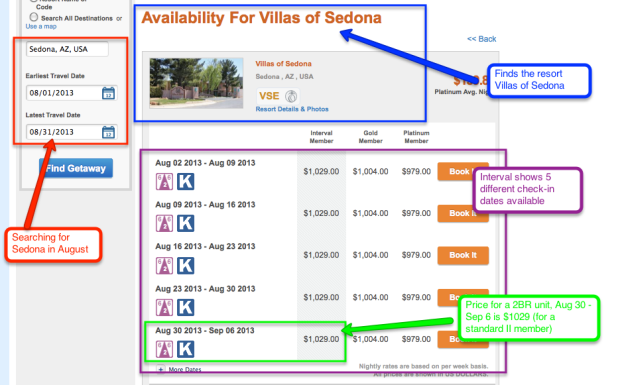 Searching for Sedona, Arizona in August, one of the resorts that showed up was Villas of Sedona. They had 5 different check-in dates available, with a price of $1029/week (which is $147/night. Not a bad price for a 2-bedroom unit in Sedona, but not exactly bargain basement either. On RCI, there was only one check-in date available instead of 5, but you could get a 2-bedroom unit at this resort for just $621/week. That means $89/night for a 2-bedroom condo in Sedona. Now that’s a smoking deal. Interval had 5 times the availability, but RCI was 40% cheaper. Now I haven’t done extensive research on this, so I can’t say how widespread this is. It’s just a simple observation based on a little curious poking around, but I thought it was interesting enough that I wanted to share it. If you were trying to get in during early August before the kids start school, you might only find what you wanted on II, not on RCI. On the other hand, if you’ve got schedule flexibility, then RCI has a much better price. If you have dual exchange affiliations like we do, it’s definitely worth doing some comparison shopping! If this was what we wanted to book, then we could save ourselves a bundle of money by checking things out on both systems. The price difference for one week’s vacation would have paid for the extra membership fee several times over. Have you ever noticed differences like these (or totally different) between results on RCI vs. II? If so, please let us know in the comments below. We’d love to hear from you! There are so many great deals available once you get into the world of timeshares. Find out how to do this (the smart way) in our book Winning the Timeshare Game – Buying the Bargains. You can get into the game a fraction of the normal price, and we show you how. I am needing to sell my TS which I bought through II. Do you have any ideas on where I could start?? Hi Brandy – A couple of possibilities for you would be to post it for sale on redweek.com or on eBay. You can search eBay for other sales of the same timeshare to get an idea of what they’re selling for there. Best of luck with it! Hi Deanna, we really enjoy reading your posts online. We would love to learn more about you and your travels through timesharing. Please email us at talktous@rci.com so we can connect! Thanks for stopping by, Kathleen! I’ll get in touch. My observation looks this way, I own interval time share, my in-laws own RCI. They seem to pay higher maintenance fees with RCI. Could that be why RCI seemed cheaper on the above post? Thanks for your comment! The original post was focused on extra vacation prices which are separate from maintenance fees, but you have an interesting observation. I’m really not sure what the average maintenance fees for Interval vs. RCI timeshares would be. I know that both systems are associated with a wide range of resorts, so some RCI locations will have much higher MF’s than others, and same with Interval. RCI nor II charge Maintenance fees. They are charged by the resort Developers and many resorts in II are also in RCI, so that would have no bearing on the travel deal prices found in II getaways or RCI Extra Vacations. Yes, that is correct. The maintenance fee is something completely different than the prices that RCI and II charge for their Extra Vacations / Gewaways. Thanks for your comment! – Deanna. RCI is the world largest timeshare exchange company. Founded in 1974, it has more than three million members around the world and around 4000 affiliated resorts. Thanks for your comment. I can relate to the part about fees. RCI does have fees for pretty much anything you want to do, and it’s important to consider those with your total cost calculations. As for the other complaints you list, I don’t know what you mean. What terms on the website? What imprecise information? Can you please elaborate? Thanks! Thanks for your comment! Is your current II timeshare using II points, or a different points system like Marriott or Diamond Resorts? It can be quite confusing since every company has different rules! As for RCI Points, you can save them for a 2nd year and extend them for a 3rd, so you have 3 years total to use them. You can only change from II to RCI (or vice versa) if your timeshare is dual affiliated. Each timeshare can be affiliated with II, RCI, or both. You can’t switch it unless the timeshare already has that affiliation in place. Thank you so much for your response. That helps a lot. Our timeshare is only affiliated with II and it uses the II point system. What is the main difference between II points and the Marriot/diamond resorts point systems? I’d have to say the biggest difference is where you can stay. For instance, you can use Marriott points to stay at Marriott resorts. If you want to stay somewhere else, you could exchange it (via II) for a resort outside Marriott, but the main reason to own Marriott points would be to stay at a Marriott. II points can be used at any II resort. This is a huge selection, though you may find it tough to get what you want. For instance, Marriott owners get advanced preference at all the Marriott resorts, so other II owners have less availability. Beyond that, every company has their own rules about how and when you can make reservations, rules for using your points, and (of course) fees. What is the difference between say Marriott or Diamond points and RCI or II points? Do you have to purchase these RCI/ II points and if so what is the benefit to adding these points to what you already own? Thanks for your question! These are 4 different points systems, all different from each other. Marriott points are not worth the same amount as Diamond, RCI or Interval points. They’re like different currencies. Each company has their own points structure, and gives you access to a different set of resorts where you can spend those points. Hope that helps! – Deanna. I own at Club De soleil, or now somerpoint resorts and have II – Somerpoint is calling me to buy RCI platinum and convert my II, it seems pricey to me, I still have the old fashion system of banking a week or depositing a week for exchange, are you saying that II has a point system as well? do you know what value’s these plans are worth to convert? Thanks for your message! In general, I’m pretty sceptical about anything they’re selling. (; If they want you to do some pricey conversion, it has to offer a LOT of extra benefit in order to be worth the price. If you’re happy with using what you have, and exchanging with your week, then sticking with that is probably your best bet. * Should I upgrade my week to RCI points? Best of luck with it! – Deanna. Hi Deanna, I am owner of Sheraton VIstana Resort in Orlando, but I do not belong to its network. Also I am a member of RCI, but in the past 5 years RCI exchange options has been diminish and very hard to get same quality of our timeshare. This year Sheraton has the exchange option with II. My question which has better quality resorts, RCI or II? and What is the difference between been part of Sheraton network and RCI/II? Hi Kenya – Thanks for your message! Both RCI and II have some high-quality resorts in their network. If you’re interested in the big chains, II has the Starwood, Marriott and Hyatt properties, while RCI has Hilton and Disney. Exchanging is a bit different. In II you exchange your unit for one other that’s deemed “comparable” by II. In RCI, you get a certain amount of trading power units (TPUs) for your deposit. You can exchange for something the same or lower as your deposit, or save your TPUs from a couple of years to get something bigger/better. The Sheraton network is much smaller than either II or RCI. I am a Wyndham timeshare owner and my exchange is for II deposits, but Wyndham is switching everyone over to RCI deposits. I have a 10 day window to request to stay with II deposits, my question is, should I switch? Thanks for your comment! Unfortunately, there’s no simple answer for that one. The two companies have different inventory for exchanges and different ways of handling exchanges. Are you happy with the trades you’ve been getting with II, or getaways you’ve purchased through them? If so, then I’d recommend staying with II, since you might not get into the same places through RCI. If you’re not too thrilled with what you’ve gotten in II, then you could make the switch to RCI. – Deanna. 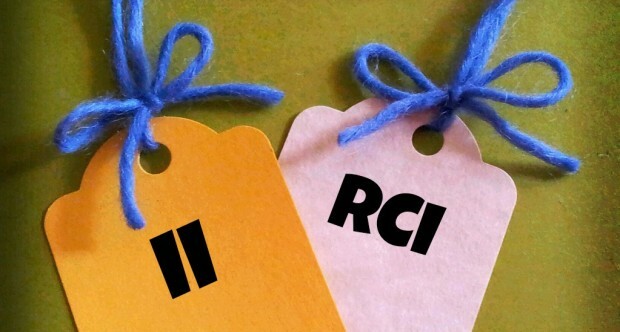 We came across your website when looking for the difference between II and RCI. We currently own a timeshare affiliated to II but they are saying that they will no longer participate with II and that we will have to switch to RCI. We will be meeting with the timeshare person to “discover” the new program with RCI. What do you suggest we ask? Could this be a good thing? Could we choose to keep II since we are very familiar with how it works? Some of the posts online make us a little worried about RCI. Your advice is greatly appreciated. Hi Adriana – There are some good things about both RCI and II, but I can understand your concern with having your program changed from what you’re used to. When you have a timeshare week in RCI, the most important thing is how much trading power that week will get you – this will be a certain number. It varies by resort, unit, week of the year, etc. I would suggest asking if they can show you how much trading power your specific week will get in RCI, and then what you can get for that trading power in places that you like to travel. I mean show you specifics, not just talk in vague generalities like “you can go anywhere in the world”. See if they will show you the numbers. Good luck with it, and I’d love to hear how it goes! Your posts are very informative, thanks. I own a timeshare in the US and have been with II. I have relocated to India and II has only 2 resorts in India whereas RCI has over 200. I am thinking of switching from II to RCI. Seems like a no brainer but am I missing anything? Also, once I have deposited weeks with II but not used them, can I ‘take them back’ and deposit with RCI?? Hi Rashmi – Thanks for your comment! It sounds like RCI would be a better choice for you, but whether you can do that depends on whether your timeshare is affiliated with RCI. If they are, then you can switch, but if the timeshare isn’t associated with RCI, you’re out of luck. And no, you cannot take back your deposited weeks from II – after you deposit them, they’re gone. Good luck with it! Question: Eagle Crest out of Redmond, OR. Has just gotten Interval int’l to change – allow members to change to II’s point system. Could you please comment on why we should or should not go with I I .
Hi Jim – So they want you to buy into II’s points? I don’t know how much they want to charge for that, but the biggest downside in doing that is probably the cost. When you later sell the timeshare, the II points aspect does NOT transfer with the sale, so that cost is just a fixed cost for you, not something you can recoup. Compared to owning a straight week, then points will give you more vacation flexibility, with shorter stay options, but is that worth the buy-in price to you? If you are happy with what you have now, then it’s probably not worth it. If short stay options are important to you, then perhaps, but you would need to weigh that. Hope that helps! Hi Leonna – Thanks for your comment! RCI is the largest timeshare exchange company. It gives you access to stay at lots of other timeshares (about 4,000 of them) that aren’t part of the Worldmark system. The way it works is that instead of using your points to book a stay at Worldmark, you would use your points to go through RCI to stay at a different resort somewhere. Please note your example isn’t comparing “apples” with “apples”. This is different, perhaps it is why the unit that sleeps 4 privately is cheaper? Good eye, Mike! Thanks for pointing that out. I’ve been a TS owner since the 70’s our current time share is in Kissimmee, Fla wk. 23. It is right behind Disiney World it’s 3 bedroom at Diamond Resorts I think it keeps changing seems every week. It’s a beautiful resort . We are with II for exchanges for the last five years we have not got the any and I mean any exchanges we’ be wanted the week has just laid there and gone wasted. I even called the dest clerk and told him to use it so it would not go to waste. So what’s our position I’ve been duped before on the sales people who have called and said they could sell it with money up front. I just hang up on any body that calls now about our T S. Should we join RCI? Hi Dave – I’m sorry to hear that your timeshare is going to waste. That is such a shame! 🙁 I’m surprised that with a 3BR timeshare you’re not able to get any exchanges. Are you depositing it to II well in advance? That’s one of the things that can make a difference. Are you looking for something very specific in exchange? The broader your request, the better the chances of finding something. As for joining RCI, if your timeshare gives you that option, I’d say go for it since you’re not happy with your II results. One advantage of RCI is that there’s more transparency & if you don’t get an exchange you want, it’s easier to see why. If it just needs more trading power than your unit has, you can save up your trading power from 2 years to exchange for something really nice, which II doesn’t let you do. See the article I’m linking to here for more info on that. Thanks for writing, and good luck with it! – Deanna. How do you go about changing from II to RCI? Do you lose the weeks you have banked? Hi Paula – If your timeshare is affiliated with both II and RCI, then you can just join RCI by paying the fee. You don’t need to drop II – you can belong to both, as long as your resort is dual-affiliated, and you pay both fees. If you drop your II membership, then you will lose any weeks you have banked with them, so it makes sense to maintain your membership there until you’ve used them. Hope that helps! I’m thinking of buying a TS just for access to extra vacations and last minute vacation discounts, probably RCI. I would buy a cheap maint. triennial just for access. Are there resorts with affilitation to both II and RCI, and if so do I have to choose one or can I join both? I travel a lot, anywhere and last minute, so double fee would be fine due to huge savings. If my resort were to switch or drop one of the systems, do you think the other system kicks you off if you are willing to continue paying,? Thanks. Hi Phil – I think that sounds like a workable strategy. There are quite a few resorts that are dual affiliated with both RCI and II. If you buy at one of those resorts, then you could join both RCI and II if you want. Since you travel a lot, belonging to both could be worth the extra fee. After belonging to both for awhile, if you find that you use one much more than the other, you could always drop your membership to the system you don’t use as much. As for what happens if your resort drops one or the other, I’ve heard anecdotally that the exchange company membership can continue as long as you keep paying your fees. I can’t swear to that, and I don’t think that’s an official policy, but I have heard that from other owners. Best of luck with it! – Deanna. I’m not in the market for another timeshare, but I’ll leave your comment here in case any other readers are interested. Good luck with it! – Deanna. Elaine, What company is your timeshare (e.g., marriott, hilton, etc) and what is the name of the property? Thanks for the info Deanna. BTW the Reply function on your website is asking me a Website name- dont understand what that really means, and I think I got an error when I tried to send this message earlier. I will just stick aol.com in there and see if that works. Hi Phil – Thanks for the info! I just finished upgrading the version of the website software. Perhaps there’s a plugin that’s not updated yet, or perhaps you happened to hit it right when I was in the middle of upgrading. I’ll look into it & see what’s happening. Thanks, and best wishes! – Deanna. Thanks so much for providing this forum to share your knowledge and experiences as well as allowing others to do the same. I’ve recently signed up for a Marriott presentation and this additional information will empower me to make an informed decision. Thanks again!!!! Sorry….forgot to ask….is red week.com the best resource for individuals who don’t want to purchase a timeshare but do want to benefit from the cheaper rates you may find from individuals wanting to sell their weeks. Also would you recommend purchasing a new ownership or looking for someone selling their membership? Thanks for the good words! Redweek is one well-known source for buying resale timeshares direct from another owner. eBay is also a large source for resale timeshares. You’ll find better prices buying from a current owner instead of straight from the developer, but always do your own research and due diligence. Check out my free Consumer Awareness Guide to Timeshares for more tips before you make your purchase. Good luck, and I hope you get one you’ll be very happy with! – Deanna. Thanks for your message! I’m sorry to hear that you’ve been getting no value from your timeshare. Is it because you can’t find a good exchange with Interval? You can only join RCI if your timeshare is affiliated with RCI. A lot of timeshares belong to either RCI or Interval, not both, but there are some that are dual affiliated. If yours is, then RCI is an option for you, otherwise you can’t switch. It seems like you’ve got a few options here: a) Find better ways to use your timeshare in Interval. I try to provide some tips on that in this blog. b) Sell it. eBay is probably the biggest marketplace for timeshares, so this can be a viable route, especially if you’re experienced with eBay. c) Rent it out. This depends on the rules for your timeshare, but most companies let you rent out a timeshare you own. You don’t get the vacation out of it, but it can help offset your maintenance fees. Thanks for all of the useful information on your site, it is very helpful. I, like some of your other comment posters am not having much fun exchanging through Interval. It seems like the inventory has really been impacted negatively. I own 3 Marriott weeks and when I asked Interval about it, they blamed Marriott, saying that Marriott is now competing with their own points based system. I called Marriott with this information and they said that they could help. They said that one of my weeks is eligible to be converted to their point system, but that the other 2 are not since I bought them after the deadline that they had established. the crazy thing is that they wanted me to pay $40k to register the other 2 weeks plus another several thousand dollars for “points” based maintenance fees on top of “weeks” based maintenance fees I already pay. I am certainly am not going to pay that kind of money, however I am at a loss for a solution. My weeks almost seem worthless. Any ideas? If my weeks are eligible should I try RCI? I am a bit leery about RCI since they got sued(and settled) for renting certain timeshare inventory deposited by members of the RCI Point Exchange Program to non-members, rather than making that inventory available for exchange solely for members. Thanks for your comment! It does make sense that Marriott inventory with II is being diminished, since Marriott is more interested in their own points program now. Of course, some Marriott week owners are still depositing directly with II, but that pool is shrinking now instead of growing. I also agree with you that it’s crazy to pay that much more money, when you already own the 3 weeks that you have. Marriott only participates with II, not RCI, so that is not an option for you. – Marriott weeks are still prime deposits in II, and the better the season and larger the unit, the better. You can deposit these with II, and still pull some great exchanges, if you branch out to look at other properties outside the Marriott circle. There are some very nice properties out there that have high quality standards, and if you do a little looking around, I’m confident that you can get some good exchanges. – You can also look into renting out the Marriott weeks that you own, and renting somewhere else instead. A good place to check out the rental rates and what’s on offer right now is Redweek.com. Thanks for stopping by, and best of luck with it! – Deanna. Hi Deanna – we just got a call from our timeshare company explaining that they were moving to Interval, but that we had the option to stay with RCI and not change anything. BUT, they (our timeshare company) were going to charge us $3500 to move to Interval. They said that they would lower our maintenance fee (by about $70/year) and never charge a special assessment again if we moved to Interval. I’m so confused now, because it sounds like we could bank our points with Interval without paying the $3500 and just paying the Interval membership fee. Does a cost to buy in to Interval like that sound reasonable? I can see how that’s confusing! It sounds like they really want you to buy into Interval points. Normally if you own a timeshare week at a resort that’s affiliated with both II and RCI, all you have to pay is the II membership fee, so the extra $3500 they’re charging must be for the II points. As for RCI vs. II, there are pros and cons. Some people like one system better, other people like the other. Personally, I’d say that if you’re happy with what you’ve been getting in your current system, then stick with that and don’t pay another $3500 when you don’t know how well that new program will work for you. If you haven’t been successful getting what you want in your current system, then you could consider making the switch. Thanks for your comment, and hope that helps! – Deanna. We have successfully exchanged with RCI for over 30 years and all is well, except that I recently acquired another timeshare that is only part of II. The II resorts sound good, but I am confused about the three II membership levels. What is the difference? Also do you have a sense about availability through II? I always bank way in advance but I notice that II has far fewer resorts so I wonder if it is more difficult to exchange that through RCI. As for the II membership levels, Gold and Platinum give you some additional benefits, for a fee of course. One of these is the ability to book short stays. Another key benefit for some people is a discount on buying Getaway vacations. If either of these is important to you, then you could go for Gold or Platinum, but otherwise you’re probably just fine with the normal membership. Good luck with it! – Deanna. Hi Deanna, my friend has a timeshare through interval and they have local resorts where they can go for the day to use the pool. Does RCI have anything like that? Thanks for your comment! It’s not really a matter of using Interval or RCI. Some timeshares offer day use, and others don’t. It depends on the specific resort where you own and what their rules are. A few years ago we acquired a timeshare in Orlando for super cheap, but joined Interval in order to have more flexibility with dates and resorts. Since then, we became DVC members. Our membership with II is up very soon and I am not sure if we should renew or switch. Since DVC is affiliated with RCI, does it make more sense to join RCI for our other timeshare? Will that gives us more options by combining or does it not really matter? I am a bit confused on how to proceed. Any help with be much appreciated. Thanks. You’re right that DVC is affiliated with RCI, not Interval. Are you planning to use your DVC for Disney vacations, or do you foresee exchanging that to stay elsewhere? If you want to exchange it, then going with RCI would make sense, but if you want to stay within Disney, then you can skip paying the RCI fees. For your other Orlando timeshare, is it affiliated with both RCI and Interval? If so, then you have a choice to make with that one. However, a lot of timeshares only belong with one company or the other. If that timeshare is only affiliated with Interval, then that’s your only choice with this one. Thanks for your question! Have you verified that the week you got from your parents is dual affiliated with both companies? A lot of timeshares only belong to one or the other, which means you don’t have any choice. If you DO have a choice, then a good place to start could be looking at both companies to see which has more of the places you want to stay. Think about where you’d like to vacation, and look through the resort directories on both sites (you should be able to view the directory without logging in). This could steer you in one directon or the other. Bear in mind that you may not be able to actually GET the trades into all of those places, just because they’re on the list.. Sure, the Four Seasons looks incredible, but unless you’ve got something worth a lot, you’re unlikely to get that trade. But still, checking on what’s available where you want to go is a good place to start! My husband and I are looking into to joining SPG with II. However I recently went on the website to look at resorts and I feel like RCI has better locations. Is it possible to stay a other timeshare resorts that are not on the list for II instead of RCI? Thanks for your question! When you join II, Interval gives you access to their set of resorts. If you want to stay at a resort that’s not part of II, then you can’t get there through Interval. There are other ways you could possibly stay at the resort you want, such as going through one of the independent exchange companies like SFX, or renting directly from another owner. But you won’t be able to get it using your II membership unless it’s affiliated with II. Hey there, me and my wife recently joined holiday inn vc and went on our first family vacation to Disney and stayed at orange lake. We then attended an ownership seminar and we decided to upgrade to more points with the switch of our home resort from Cape Canaveral to Williamsburg VA. Williamsburg is the only HIVC that exchanges through II, as all other owners in the network go through RCI. We’re new to this and are wondering if we did ourselves a disservice by giving up last calls for getaways. We are from New England and think that we would use this type of options for ski seasons often and your example at the top seems to make me nervous that I’m going to spend a lot more for short notice options since we have to use II. Am I reading into this correctly that getaways are always going to cost more than rci last calls? Thanks for any help you could provide. Hi how do i go about finding out if my resort is affiliated with either II or RCI? Thanks for your message! The simplest thing is to just call your timeshare and ask. Curious to know how you got dual membership with II and RCI. Did you have to buy two separate time shares? I have a timeshare with Westgate Lakes in Orlando. I am also a member of their West Cruise and Travel. I am not going to be able to use my timeshare before the end of the year. I m am debating depositing my week with Westgate cruise and travel I have been looking at Interval International and RCI. I am very confused trying to figure out what will be best for me. Hi Deanna: I own 1 week with Sheraton Vistana Resort in Florida since 1980s (still using the weeks system). I have deposited with RCI using trading power ( 2017 to 2019 – 82 Deposit Trading power; 2016 to 2019 – 4 Trading power; 2017 to 2020 – 26 trading points = total 112 Trading Points to use). I just received a free two year membership to Interval International from Vistana. I assume this tells me Vistana belongs to both RCI and II. I have banked all my available weeks with RCI. Does that mean I can’t use II until next year when I have available week to deposit with II and then exchange? I’m just starting to understand RCI but it would be nice to access the Interval International Resorts, more choices. Any comments? Thanks. Thanks for your comment! You won’t be able to get an exchange with II until you have something to exchange. But II typically (*subject to some resort-specific rules) lets you deposit a week up to 2 years before your check-in date. That means you could theoretically deposit a 2020 week with II in 2018, and use that for an exchange. Not all resorts let you have the full window, and you’ll probably have to have the maintenance fees paid in advance in order to do the deposit. II will also let you do a “request first” exchange, but you still have to have a timeshare identified to use for the trade — you just don’t actually have to deposit it until they find you a match. Hi Deanna. I’m not new new at timeshares and exchanges, but I’m pretty ignorant really, when it comes to good choices. I just got a deeded week in Virginia, and don’t plan to travel there often, so exchanging will be important knowledge for me. Sadly since I work two jobs, birth during the school year, I don’t have a lot of research time to make the best choice. My deeded week is 27. I Love Disney but I fermenter through II we couldn’t exchange at any Disney resorts. It’s RCI my only option for Disney? I haven’t joined either exchange company yet. Is there a sort version of which is better? I can research over the summer, but for now my time is incredibly limited to research. Any quick tips I Must know since I need to decide soon to use my week for exchange over this summer? Thank you so much. This has been an informative page and the reader comments have been informative as well. If you want Disney, then you’ve got to go with RVI. You should know, however, that Disney is very popular, and is not an easy exchange to get. It will typically require a high number of TPUs (trading power units) in order to get a Disney trade. Fortunately, RCI does tell you how many TPUs your timeshare will get in exchange, and you can browse the listings of what’s currently open and see how many TPUs they would take, even if you don’t have enough. For instance, if you see that your timeshare gets 29 TPUs, and the Disney you’d really like costs 53 TPUs, then you’d either need to combine 2 years worth of your timeshare deposits, or look at other options that are cheaper than Disney. Wow I wish I would have proofread that comment. I hope you can figure out what I’m saying. Yes, this is a possible strategy, but I have to warn you there are significant risks. There are some small numbers of Marriotts available, generally only the smallest units in the off seasons. But there is a chance that the Marriott policy could change so that these are no longer available at all. Also, as you know, every timeshare has a risk of escalating fees. Even if you get one with a good track record of low fees, they might be bought up by another company, which can change the situation dramatically. So yes, it’s possible, & might work for you today. But I’d caution against it, because either of these changes (neither of which you can control or predict) could mean it no longer gives you the results you want. Thanks for sharing! All comments are held for moderation, and manually approved before they appear. Are timeshares still about timeshares? Timeshare exchange fees – How much is too much?